This chocolate cake might look a little intimidating on first inspection, but it is actually made using several very simple techniques. With my instructions you can’t go far wrong with the methods and once you’ve made it once you’ll have a go-to show stopper for Birthday gatherings and dessert spread centre pieces. Preheat the oven to 170c (fan) then grease and line two 18cm loose bottom cake tins. In a large bowl, mix together the plain flour, caster sugar, baking powder, bicarbonate of soda, salt and cocoa powder with a wooden spoon. Put your chocolate in a heatproof bowl and melt over a simmering pan. Meanwhile in a jug, whisk together the eggs, milk, oil and vanilla extract. Remove the melted chocolate from the heat and leave to cool slightly. In three additions, add the wet mixture to the dry, mixing well as you go. Once smooth, pour in the melted chocolate and combine. Last of all, slowly pour the boiling water into the bowl and gently stir until smooth (the mix will be very liquid, but this makes the cake deliciously moist and fudgy). Split the cake mix between your two tins and place on the middle shelf of the oven. Bake for 40 minutes or until a skewer comes out clean. Once cooked leave to cool on a rack. While your sponges are baking, start on your striped jaconde sponge (this is made up of a decorative chocolate paste and a simple, light brown sponge mix). Simply combine these ingredients in a small bowl. Now, here is the tricky bit. Line a 10x12inch shallow baking tray with baking paper (ensure the baking paper is big enough to line the walls of the tray too). Cut a separate piece of baking paper to the exact size of the bottom of the tray (10×12) and place on top of the larger piece. Take the 10x12inch rectangle of baking paper and spread your decorative paste all over it in a thin 2-3mm layer, all the way to the edges. 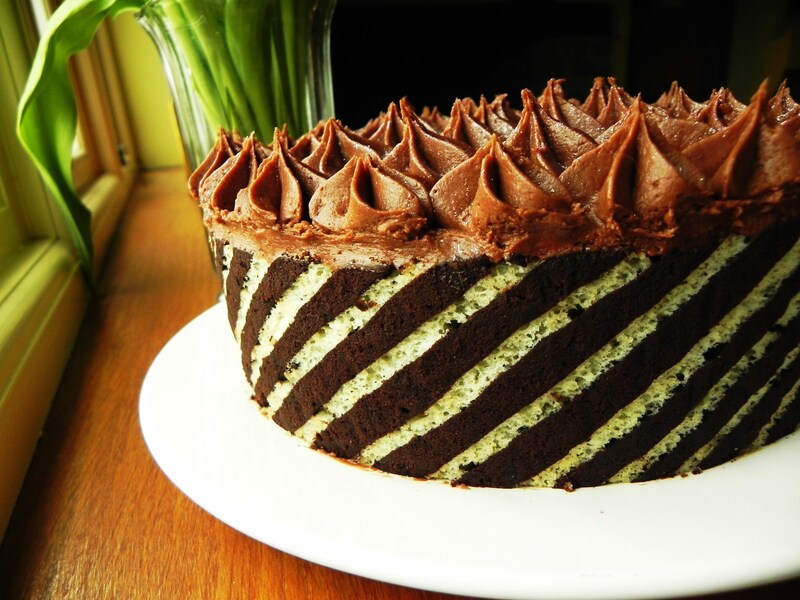 Now, with a chop stick (or similar tool with squared off end) draw diagonal stripes through the paste so you are left with lots of chocolate lines separated by the lines of baking parchment (this creates the stripey effect on the outer edge of the cake). Put the rectangle with the stripes on back into the lined baking tray and place in the fridge to firm up for 20 minutes while you make your jaconde sponge mix. Up the oven temperature to 220c (fan). Now, in a clean bowl whisk your whites until stiff peaks are formed. Slowly add your caster sugar, still whisking, until a glossy meringue mix is achieved. Set aside. In a separate bowl, whisk your almonds, icing sugar and whole eggs until pale and fluffy. Fold in the flour, then the meringue mix. Finally, pour the melted butter in slowly and very carefully combine. The mix should be light and airy. Retrieve your baking tray from the fridge. Pour the jaconde sponge mix evenly over the stripes of paste, using a spatula to make sure the gap between each chocolate line is filled. Place in the oven for 5-7 minutes, or until pale brown. Once baked,turn the tray upside down onto a work surface and peel away the baking paper. You should be left with a thin rectangle of jaconde sponge with a pin stripe pattern across it. Leave to cool slightly. Combine the butter and icing sugar, loosening with the double cream as you go along. Add the melted dark chocolate and the cocoa powder then whisk vigorously until smooth and workable. 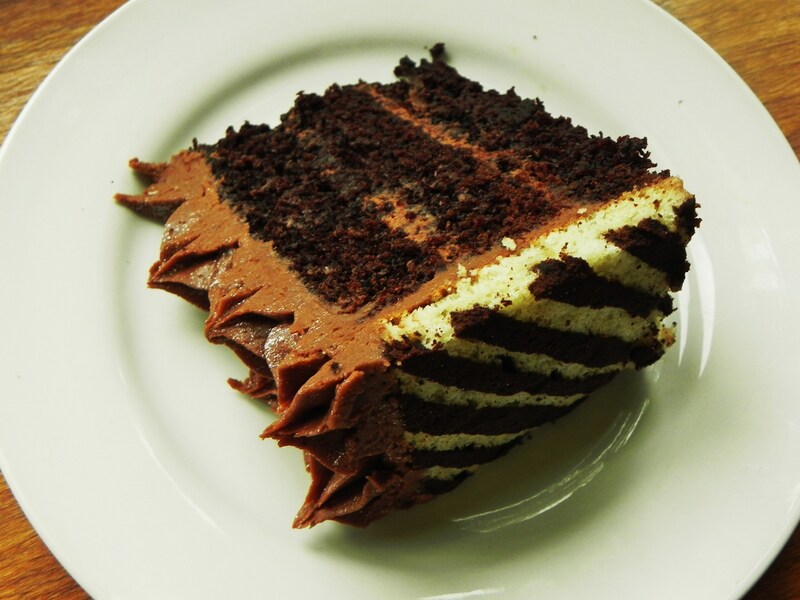 Cut your two chocolate sponges in half and layer on top of each other with a generous spreading of chocolate frosting between ( I only used three layers as I didn’t want to create a huge cake as it’s not for a special occasion!). Cover the outside of the four layer (or three if you like) cake with frosting and smooth to the desired effect. Now, cut your jaconde sponge into two long rectangles. Measure your cake to gage the exact dimensions you will need to cover the outside of it. I needed two 4.5x12inch shapes. Don’t worry if you cut your jaconde a little too large, you can always trim it. Wrap the sponge rectangles around your frosted cake and press onto the sides to secure. Trim if necessary. Now, for a final flourish, pipe little stars of the remaining fudge icing all over the top and scatter with glitter. Good morning, I have a 16 year old daughter who happens to be the baker in the family. She loves to bake and is considering attending a pastry school. She loves to make all sorts of wonderful creations. I’m so glad I saw this on my blog roll and can’t wait to show her the recipe and your post of course. Your cake looks stunning, a real piece of edible art! Cheers! Ah brilliant and good for her, it’s a great interest to have as it makes everyone happy! I hope she enjoys this cake recipe! This looks fab! I am going to squirrel this recipe away and try it for my husband’s 40th. Ohh yes it would be ideal for that I’m sure! Good luck! Oh my god. This looks divine. Thankyou! Must taste alright too considering I had eaten a slice before 9:30…! This cake is beautiful! It also looks delicious! I want to use this for my other half’s 40th later this year. I wish I could have shared this on my Twitter feed, too! I always wanted to know how to do a patter on the out side of a cake like that. Dose the jaconde sponge dry out? Fascinating…decorating cake with more cake. So COOL! It’s great as you can use any pattern once you’ve mastered it! As long as you generously frost the base cake the jaconde shouldn’t dry out! 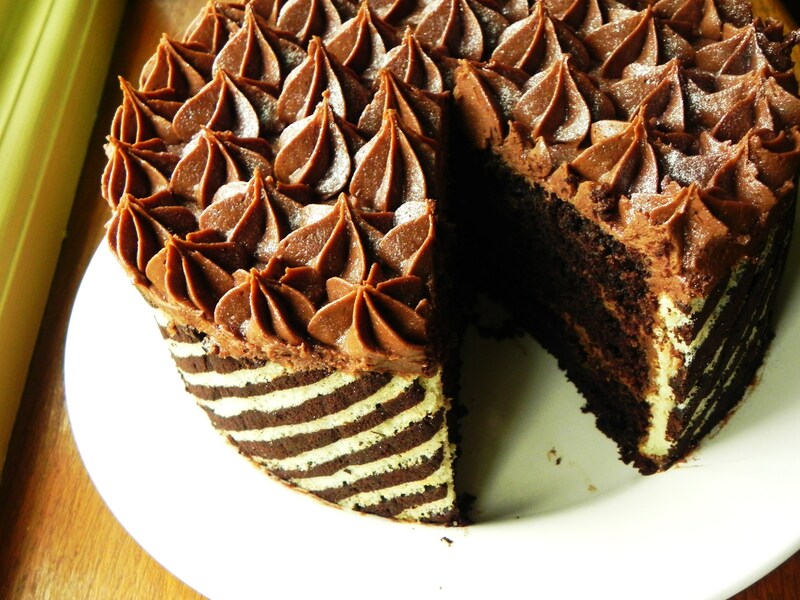 This cake looks so decadent and beautiful! What a clever effect. It looks so good! Thanks- I saw it on the Great British Bake Off and had to figure out how to do it too! Was that the orange and chocolate one Mary Ann did in series 2? I loved the look of that! Gotta love GBBO – great source of inspiration! Yes that’s the one! I vaguely remembered her saying something about jaconde sponge so had to try it out! Oh definitely, it’s the best! Thanks! Try it out it tastes so dreamy! This one looks great! An impressive one to pull out at a party. I love the title you chose, “Show Stopper,” because I immediately stopped in my tracks as I scrolled through my reader! I’m going to try this! It really is a show stopper! It’s also intimidating on second inspection. Stunning!! Absolutely STUNNING! Although your instructions make it seem do-able, it really is most fabulously daunting looking!! Beautiful Cake! If that was in a case I would consider it a real treat to get it! Bake on girl! Your really talented!